Barbados has several special animals - the green house lizard, the whistling frog, the firefly and the top of the list, the Barbados Green Monkey. 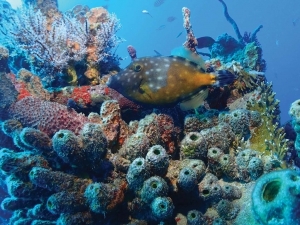 Underwater Barbados however is where the best of Barbados nature resides. The best place to enjoy Barbados Green Monkey at the Barbados Wildlife Reserve and Grenade Hall Forest but they are also at Welchman Hall Gully. For underwater nature you can go:- diving with one of the many dive shops, snorkelling over the coral reefs close to shore, on a trip on the Atlantis Submarine or visit Folkstone Underwater Museum.